I’ve been getting some messages recently from a contact on my MSN Messenger that clearly aren’t from who they seem to be from. Rather than sending me the usual mixture of adult content and news about Steven Seagal I’ve been getting funny image links and cutesy links from this particular, earthy, northern contact. Obviously something’s afoot. The man has a virus (this we knew years ago, but hey ho). 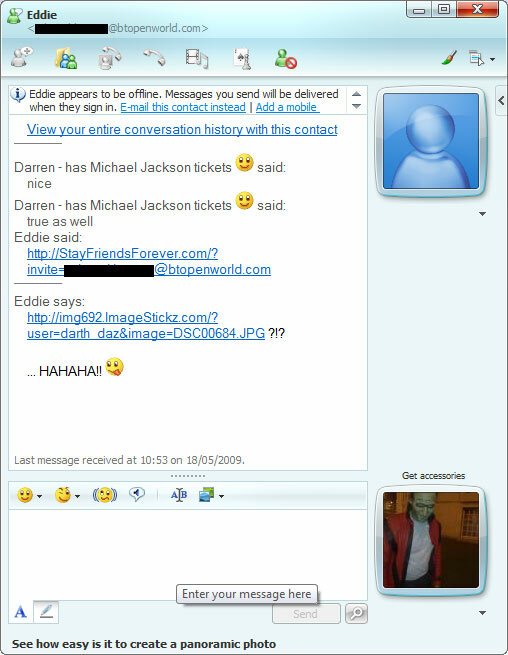 It’s not actually ‘Eddie’ sending this rubbish, instead it’s his computor, or rather his MSN Messenger, which is infected with something nasty. It’s trying to infect others and is sending this gibberish out so that contacts click on the link and download the virus themselves. Its called Windows Live Messenger, not MSN. If you get this virus, I advide you to restore your system. It is the only way I have found to remove it.